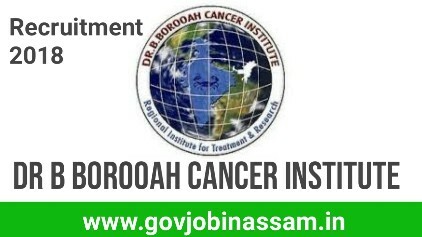 Invited application from Dr B Borooah Cancer Institute Recruitment for the contractual NCDIR (ICMR) supported project “Population Based Cancer Registry in Field Investigator and Data Entry Operator posts. Interested candidates have to apply offline for the following Dr B Borooah Cancer Institute Recruitment vacancies. Educational Qualification: Master Degree in Sociology / Master in Social Work (MSW) from a recognized University with minimum 1 year experience in health related organization. Educational Qualification: Graduate with DOEACC ‘A’ Level Diploma in Computer Sciences from a recognized Institute with minimum 1 year experience of working in health related institution and typing proficiency with software knowledge. For Data Entry Operator, both practical test (computer typing test) and interview (viva-voce) will be conducted, which will be notified in the website at the time of publication of the list of eligible candidates on 29.09.2018. Note* The applicants, who do not have requisite qualifications up to the last date of submission of applications, will not be considered.